Confession: I have a Solitaire addition. It’s my favorite guilty pleasure that I excuse by considering it an Alzheimer’s prevention activity. 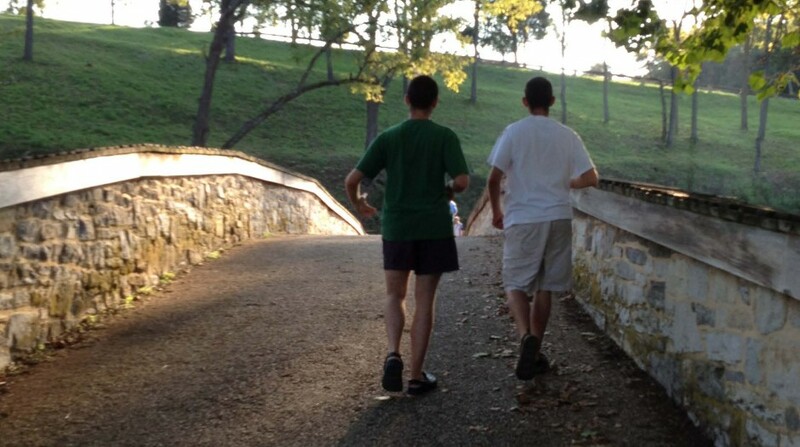 But really it stokes my need to solve something, anything – particularly only days where curing autism on the side of a day-job that has an increasing share of frustrations, and the molasses-poured pace of the boys’ progress make me question if we are making any progress at all. Around noon today after a few work hassles while waiting for someone else I allowed myself 3 minutes when I should be been doing 500 other things to solve the Daily Solitaire Challenge I couldn’t get this morning. I recently changed my preferred settings to be 3-card draw which supposedly is harder. I’m still not mastering the deal, so like autism I find myself re-dealing and replaying the same hand some ridiculous number of times, like the win mattered. After repeated fails, there’s an aha! that feels sweet – a boost upon the day, and a lingering lesson that sometimes I figure out, and sometimes inspires more questions. Last night we had a similar mini-moment with Will and Jeff attending “Rock of Ages” on Boston. The plot- sweet Midwestern girl turns stripper, sees the light and wins her man – wouldn’t have been my pick. But our neighbor’s daughter the budding actor was a lead, Jenn our daughter suggested it, so – why not? Fortunately the bawdy body jokes and expletives flew by the boys’ language cognition, and two last-minute grabs from the car somewhat saved the day – word cards and a squishy ball. Yeah they’re stimmy toys, but in the spirit of accommodating particularly in non-preferred environments, it seemed a bargain I could strike. Life must be so hard when so many environments just don’t feel right, or you’re subjected to experiences that you dread. Jeff so willingly said Yes to a play in Boston this weekend that I forgotten how much he hates loud environments. With Will, because he initially said No to going, I made a deal with him. I told him how much Mom and Dad wanted to go, that Jeff wanted to a well, and that if Will did what Mom wanted on Sunday, Will could choose the activity of the day on Monday. I also reminded him to use his words if he needed a bathroom visit or a break. The result was – it worked. Will jumped up to attempt an escape just once, perhaps even to adjust his long pants, but that’s far better than sometimes. He actually did use his words to request the bathroom near the end of the first act and waited nicely until intermission. Despite the self-talk Jeff was manageable and both tolerated waiting at the stage door for the neighborhood thespian to emerge with the larger than life hug. I get frustrated with myself over time-wasters of any time and particularly my Solitaire thing. I don’t understand why I cling to it, and what it gives me. I insist on ritualistic adherence to many tasks in the boys day, and often wonder if it’s best to skip it all. I’m not sure which of multiple rearrangements of the deck eventually give me a win, whether the insistence on treadmill or brisk walks with Jeff prior to speech will make him attend, or labeling family drink cups in the seemingly futile hope that they won’t steal my Diet Coke because it has my name on it let alone steal someone else’s as a party. Yet maybe our time-wasters simply set the stage for the bigger win, like yesterday. After multiple theater-movies where I missed half the show – after the Urban Nutcracker last year where Paul took Will out of the theater at least 6 times – we figure out how to work the hand we were dealt – and had one of those happy-stances when bum neurology met the real world and life proceeded as if we didn’t have autism, or barely. In this game of life, here’s hoping the way we play the seemingly insignificant games leads us to the bigger prize. This entry was posted in Uncategorized on October 29, 2018 by twinmom. Hope. This image may look like just another gorgeous mountain range across a lake. But it’s my talisman of what is possible, and the beauty and peace waiting whenever the autism-life is turbulent. It speaks to turning challenge into opportunity – disability into achievement – frustration into joy. We’re atop Mt. 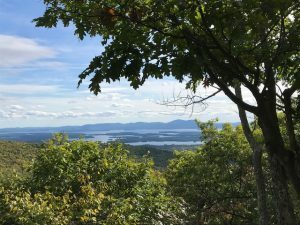 Shaw in Moultonborough NH, a peak on a list of superb viewpoints that we’re hiking lately. The picture was taken from no place special really – just a random descent on a lovely Sunday where the trek went faster and easier than expected. The peaks in view aren’t brag-worthy hikes that ultra-marathoners list in a can-you-top-this post on Facebook. They’re local and accessible and gorgeous, and coincidentally they’re trails we’re volunteering to help maintain. The boys did great ascending this hike, and after a quiet period eating his snack at the summit, the real Will emerged. He jumped up with loud non-word happy noises that startled a fellow hiker talking to us but quickly melted everyone into smiles. It’s the Will that hiking brings out – whose joy that can’t always find words but who bursts forward when there’s views around and shows me that I didn’t imagine his liking his sport. Jeff usually isn’t as demonstrative this way, nor was he yesterday, but he was soaking in the view in his own way. He’s exceedingly patient as always when I want to linger for 45 minutes taking pictures and using my new favorite obsession, the PeakAR app that ID’s the mountains in view. I love testing my internal geography around us, but more than anything I love remembering the times we hiked each, then dreaming of the next ones to bag. Ostensibly my excuse for too much summit picture-taking is to make “what did we do this weekend?” social stories for the boys to send to their day program, something I’ve done each Monday for over 10 years at a teacher’s urging. Sometimes I indulge myself in writing the names of each peak on the photo’s horizon, a probably not too disguised statement of pride on how many we have conquered. Mostly the day program ignores these, and I often question why I bother – except deep down I know why. It’s probably just as much for me as for them. Mondays are few people’s favorite days, nor mine. But lately I begin each, no matter how busy I am with work, by emphatically prioritizing the long view if only with one action item that however small puts boots on the ground of my journey there. Autism makes our family’s days highly structured, filled with repetition and pushing others to do things they don’t want, despite perennial irritants like respite worker cancellations and cleaning up spilled milk literally and figuratively. Sitting atop a laptop pales in comparison to a summit no matter how engaging the effort, and ascending stairs for yet another pile of laundry is far from rewarding. So when I start my Monday by doing something, anything, to address my own personal goals, I feel as if I’m still on that one, continuous trail toward habilitation for the boys, and last but certainly not least, happiness for me. Call it a Monday me-first action item, or just my quirk. I take action each morning to make my world more of what it needs to be, and for today, I made this picture my lock screen. Now every time I look at the technology that chains me to the desk, I get to remember where we stepped a day or so ago, and visualize the horizon of my many tomorrows across a sky that will be dotted with even more meaning and joy. Here’s to Monday – and here’s to omni-present hope. This entry was posted in Uncategorized on October 1, 2018 by twinmom.